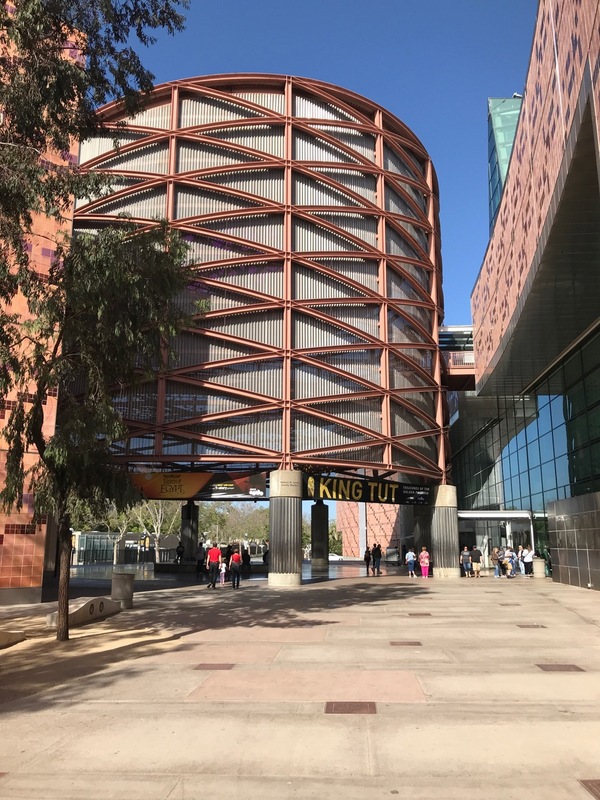 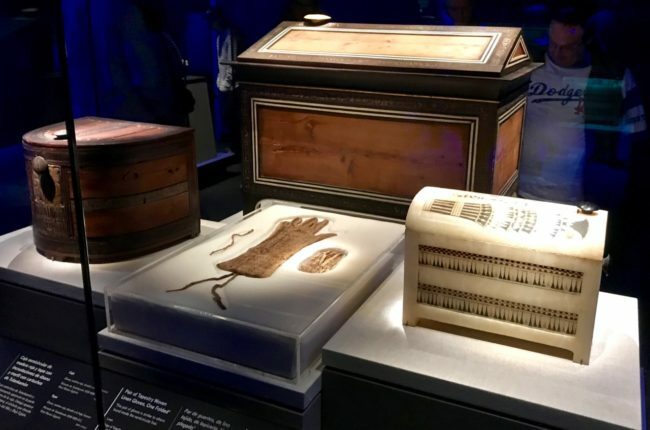 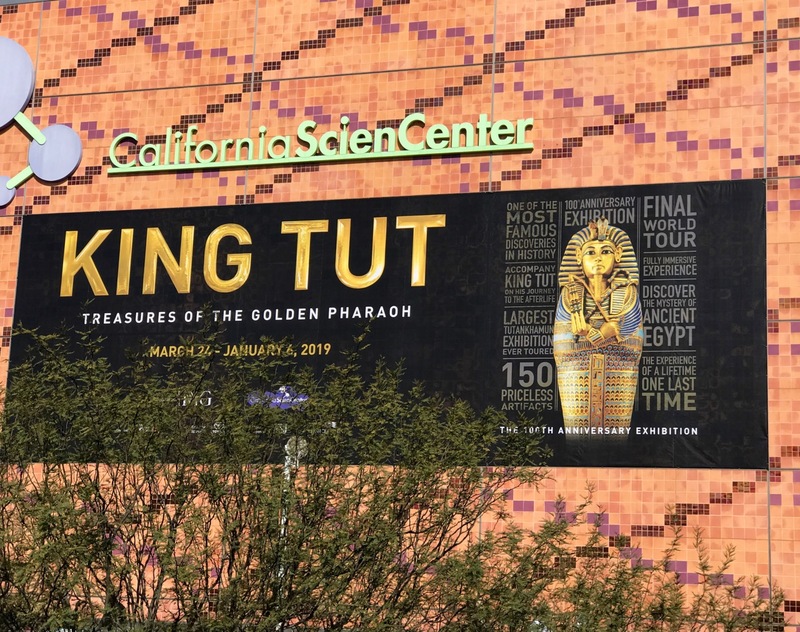 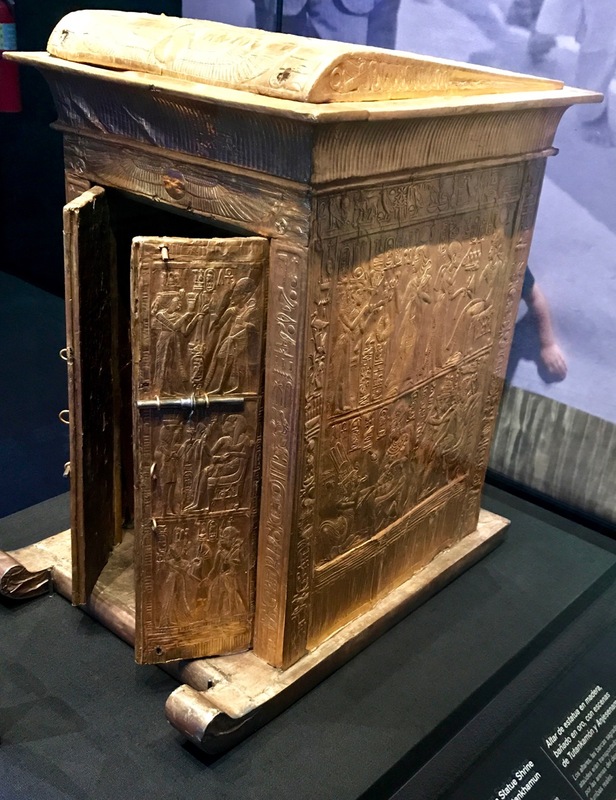 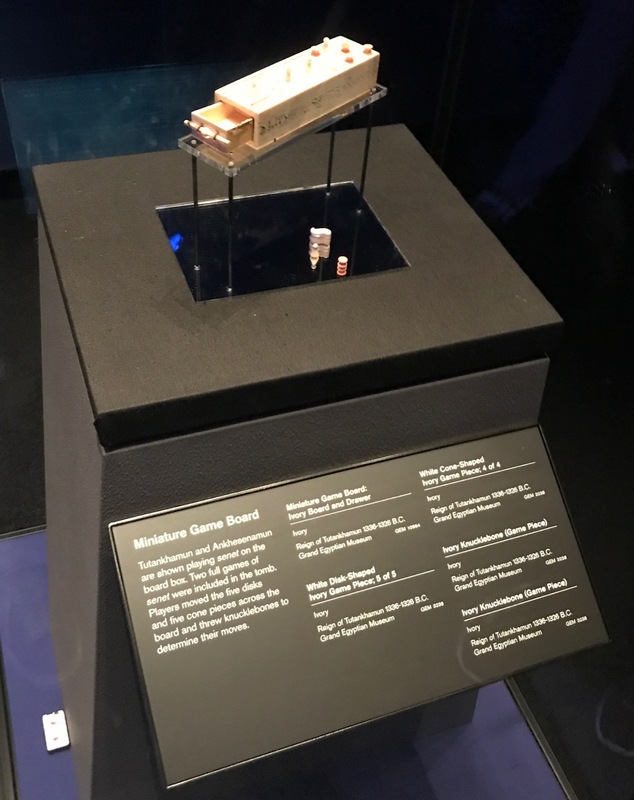 Although no “condo made of stone-a” could be found, Tracy and I recently had the opportunity to witness more than 150 ancient Egyptian artifacts from the tomb of the world’s most famous pharaoh, King Tutankhamun, at the California Science Center (or as they spell it, “ScienCenter”) in Los Angeles. King Tut: Treasures of the Golden Pharaoh has been dubbed “the largest King Tut exhibition” ever! 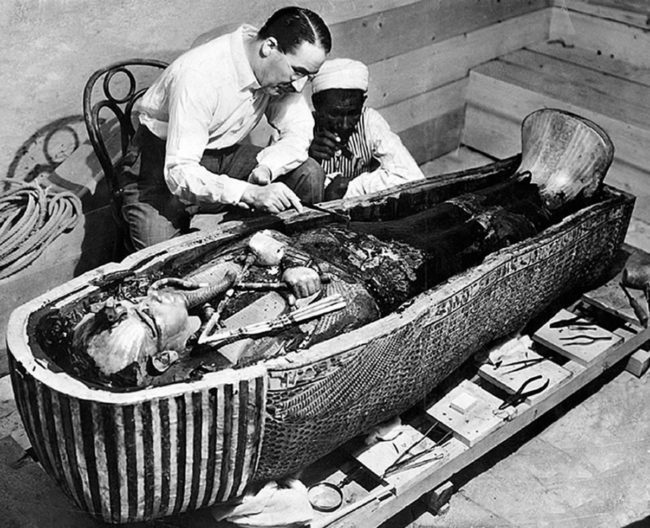 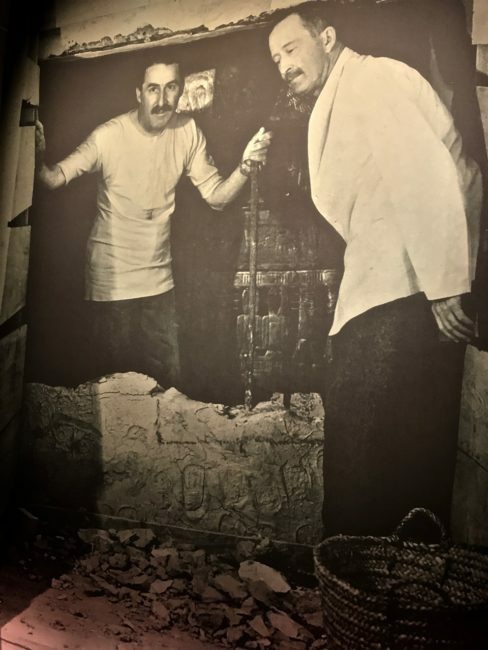 King Tutankhamun died around 1323 BC at the age of 19, and was virtually lost to history until 1922 when British archaeologist Howard Carter discovered his tomb in the Valley of the Kings in Egypt. 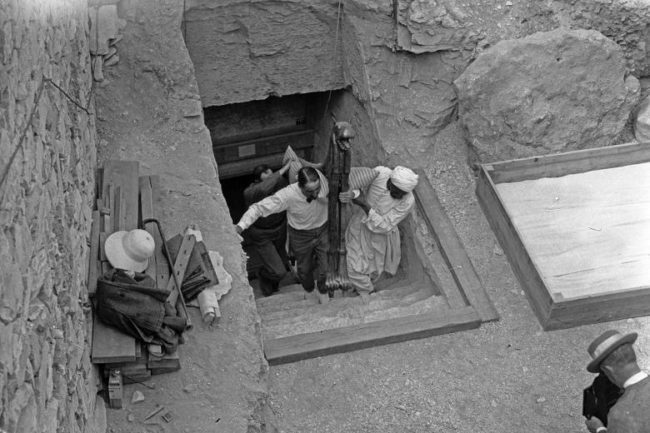 Carter had started excavating in Egypt in 1891 but only began a concerted effort to find Tut after the end of World War I. Now, Tracy and I would get to see some of them. 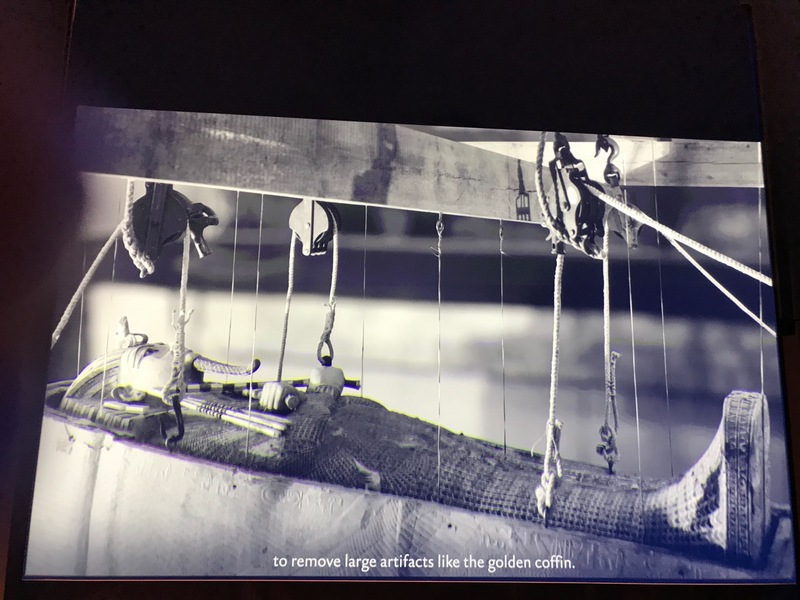 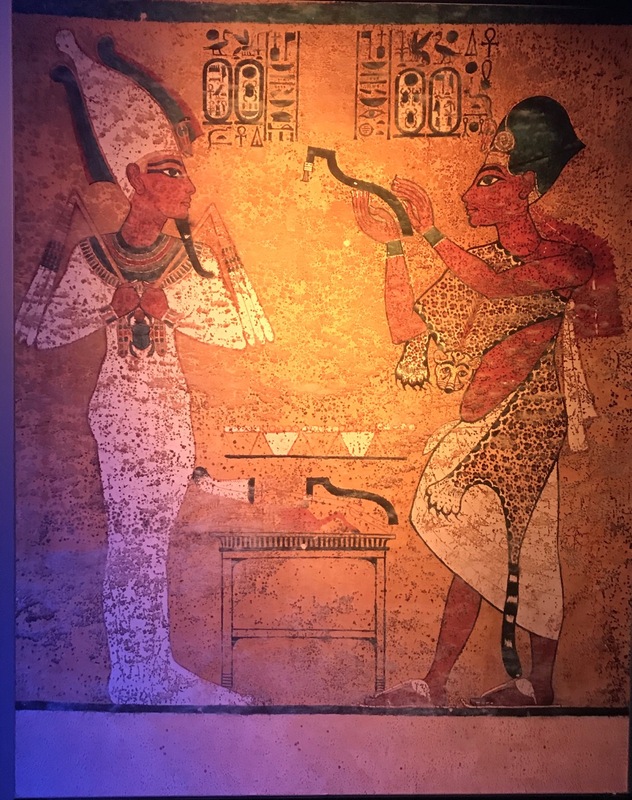 Before entering the first of the galleries displaying Tut’s artifacts, we watched a four-minute movie on a 180-degree screen detailing facts about the discovery of the tomb. 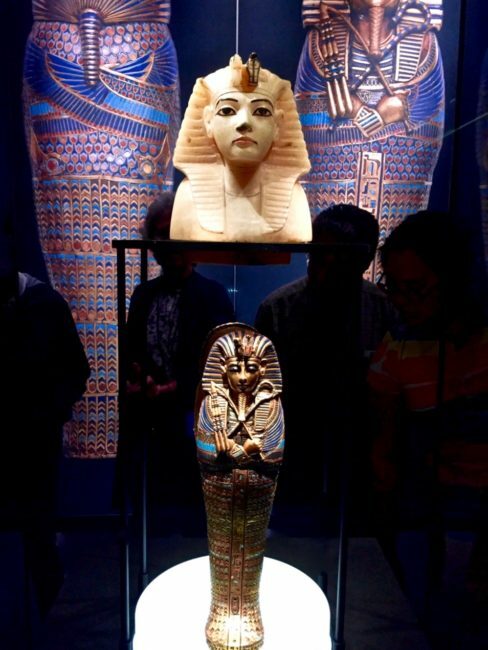 Inside, we joined some VIPs who had entered early (it was crowded already, so I can only imagine the mass of humanity later in the day). 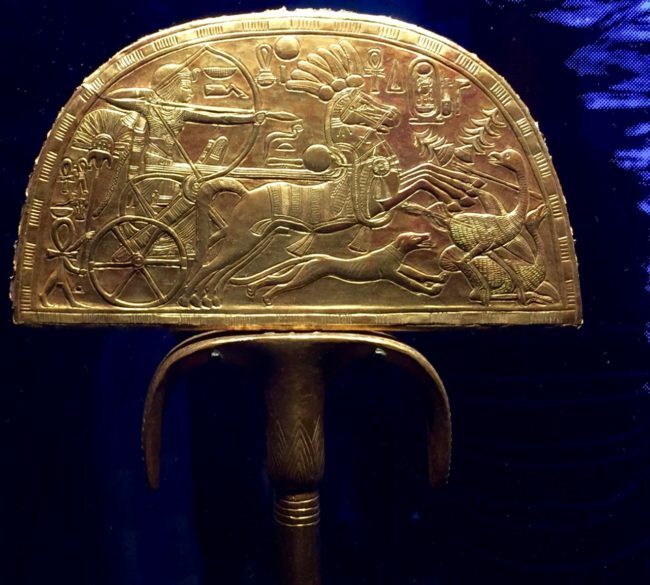 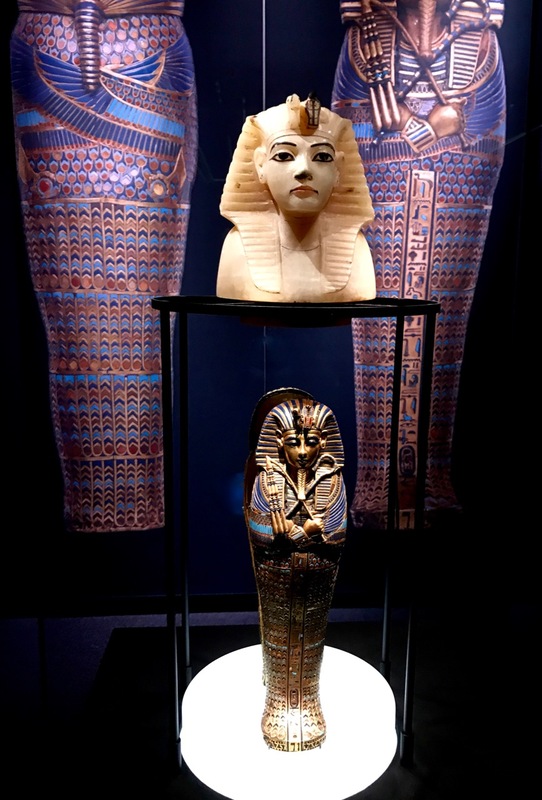 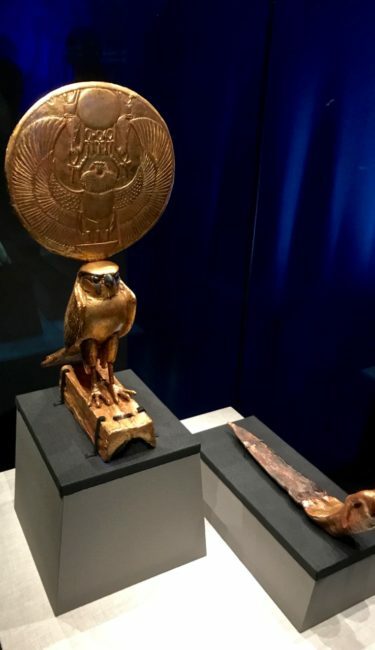 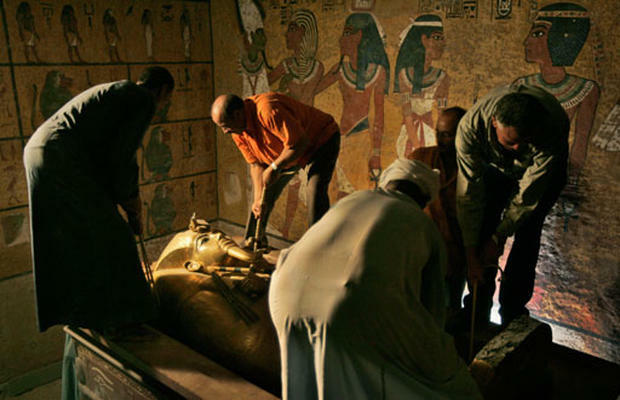 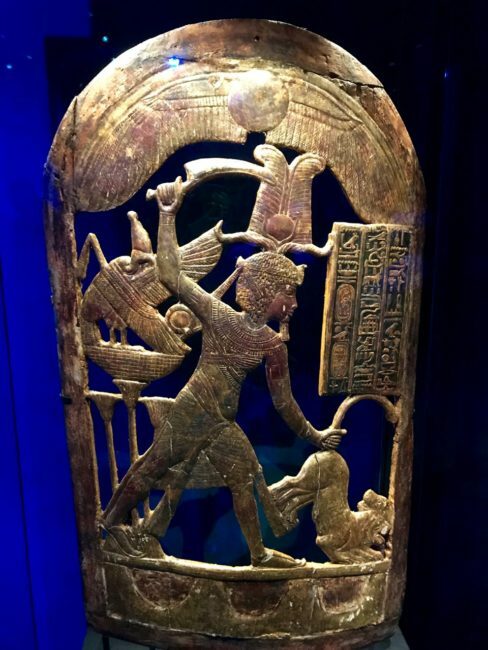 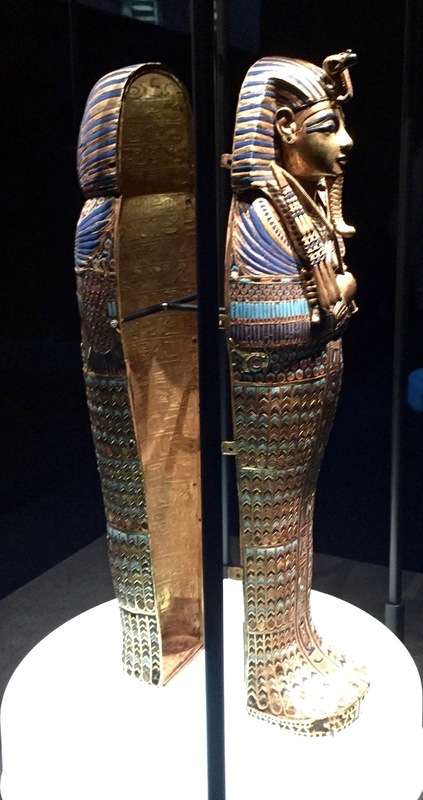 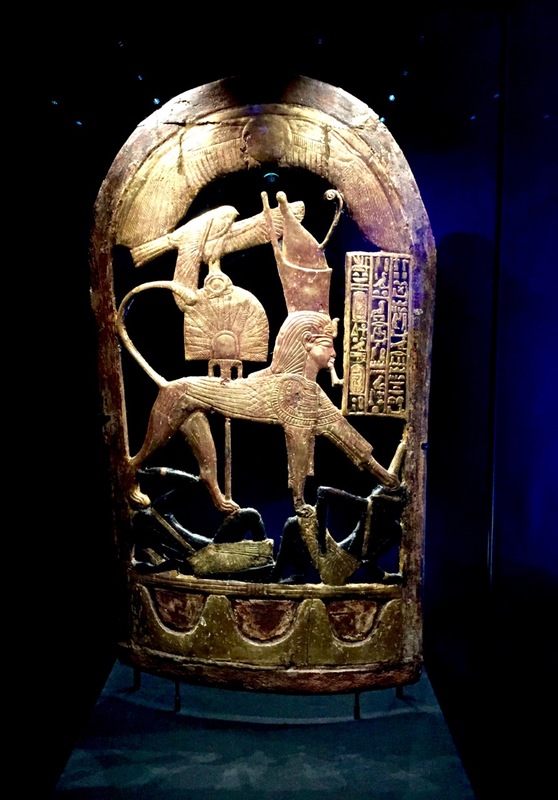 It was time to check out what artifacts entered into the afterworld with Tut, who died at that early age due to an infection he received after breaking his leg. 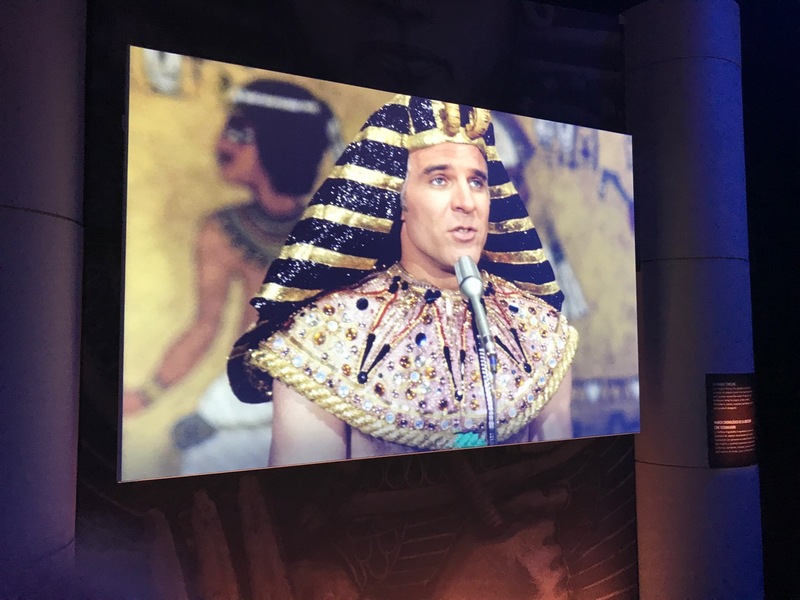 Here are some of the highlights. Although we purchased audio guides ($6 online) unless you are a serious Egyptologist the signage on all the displays tell you everything you probably need to know. 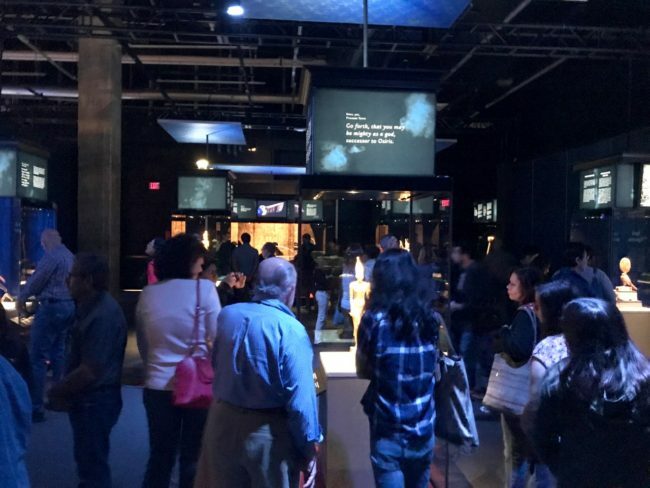 However, for those who want to spend a lot of time here and take a closer view, there are numerous multimedia presentations that can thrill your inner scientist. 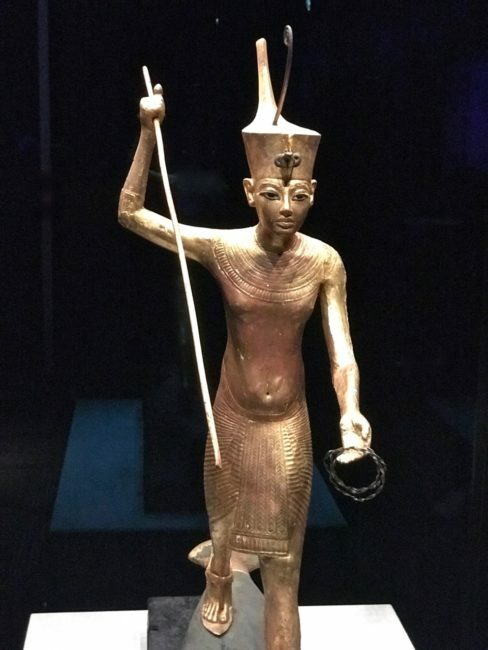 Tut was prepared for his voyage “to the Netherworld” by Priests who packed the tomb with everything he would need, although I did not see a toothbrush. 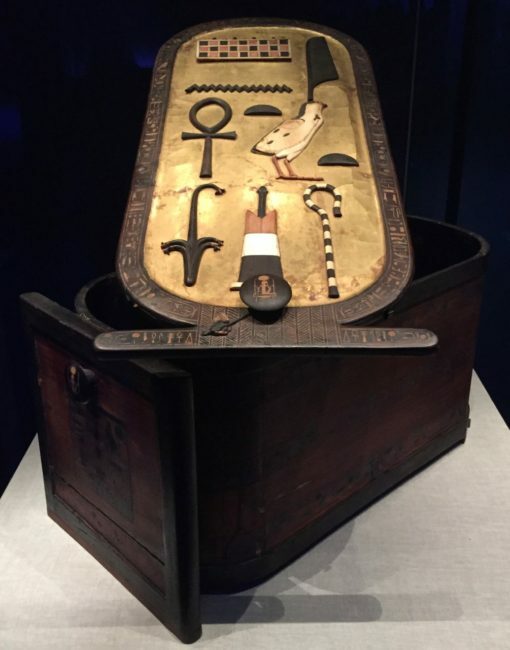 Every dead king needs some games to play as they journey through the afterlife. A red, wooden box and lid inlaid with Ebony and Ivory and contained cartouches of Tut. 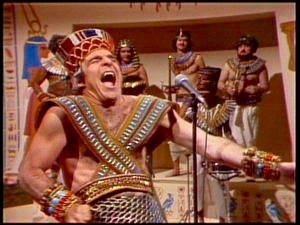 It did not, however, play the song. We checked out a gilded wooden and ivory pen case shaped like an architectural column. I wondered what postage to mail a letter from the Netherworld cost in those days. 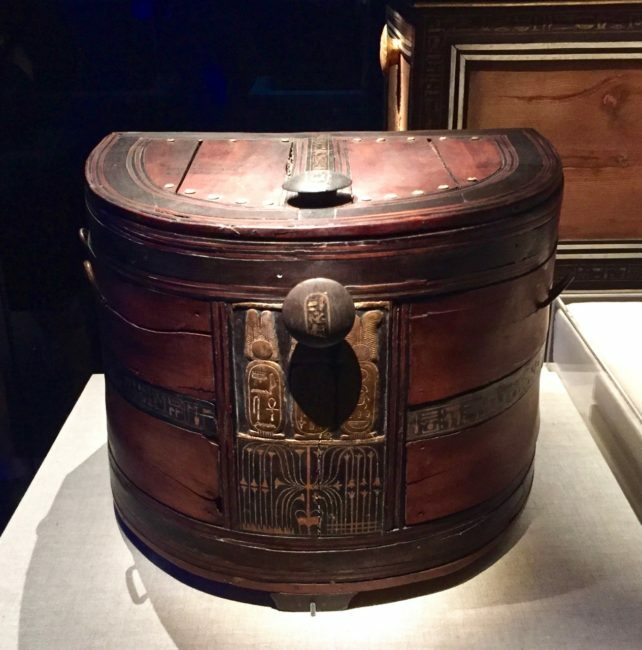 This ebony and cedar chest includes names and epithets of Tut. 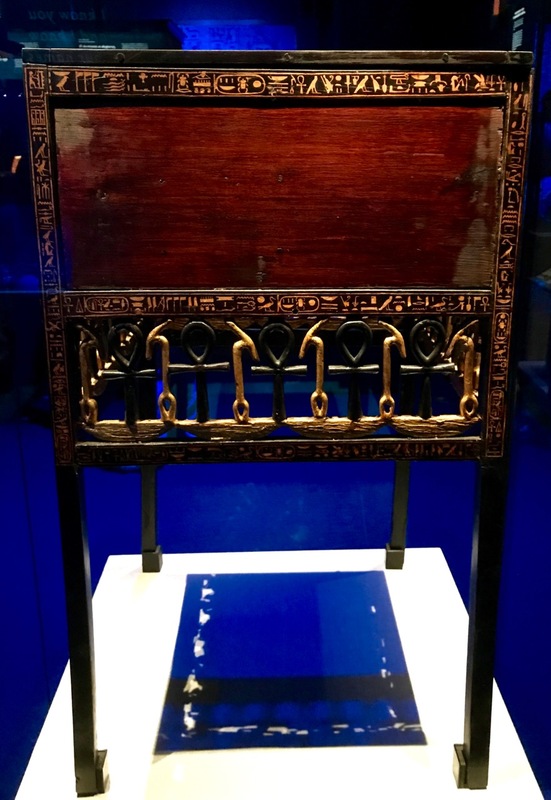 He could stash some of his expensive jewelry in this inlaid box. King Tut watched a lot of energy infomercials because he took his Painted Wooden Model Solar Boat with Throne & Two Paddles on his Afterlife adventure. 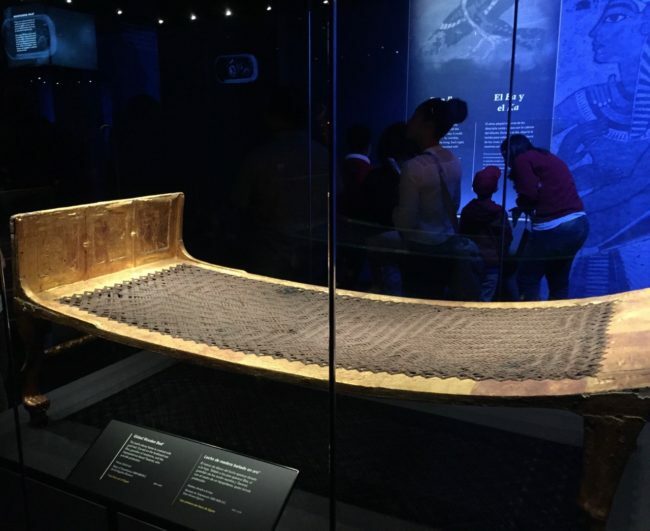 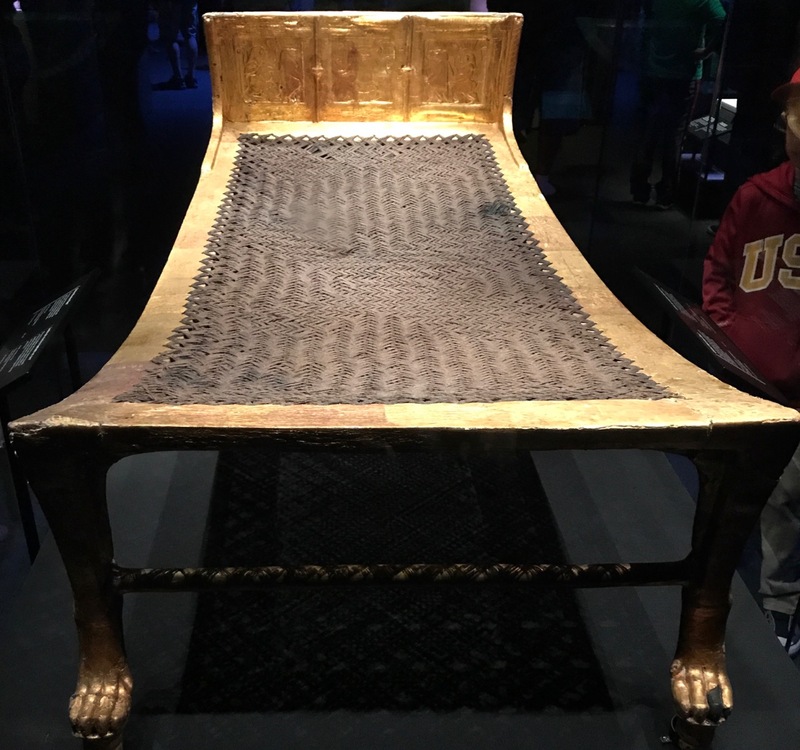 Hopefully, Tut had a good mattress for this gilded, wooden ceremonial bed, which was apparently built for his funeral. The lion feet are there to guard him. a silver trumpet (the Louis Armstrong of the Netherworld? 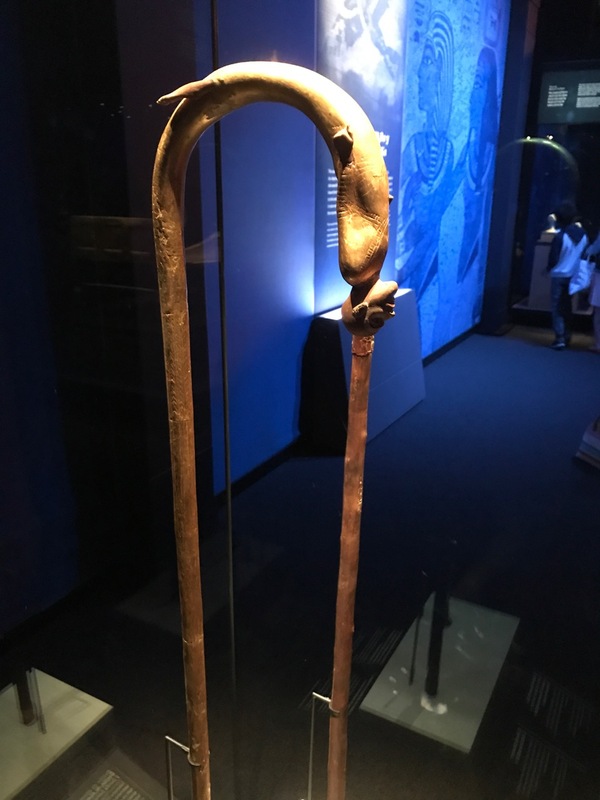 ), and a walking stick. 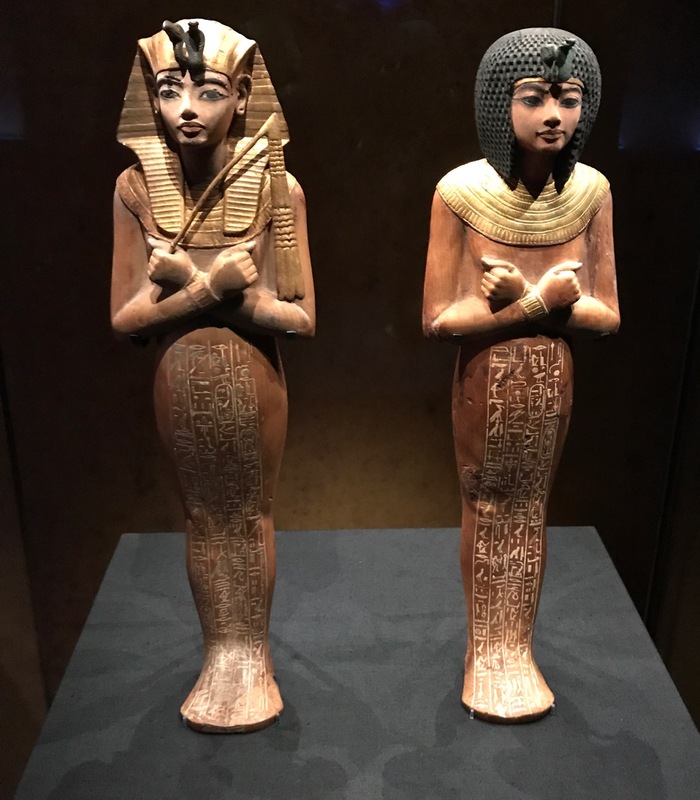 There was lots of “slaying” going on in these figures. 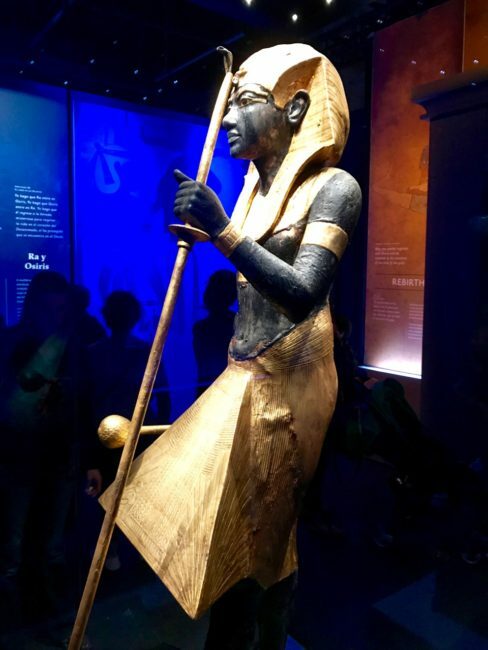 The Wooden Guardian Statue of the Ka (Pharaoh) of the King was impressive from all angles. 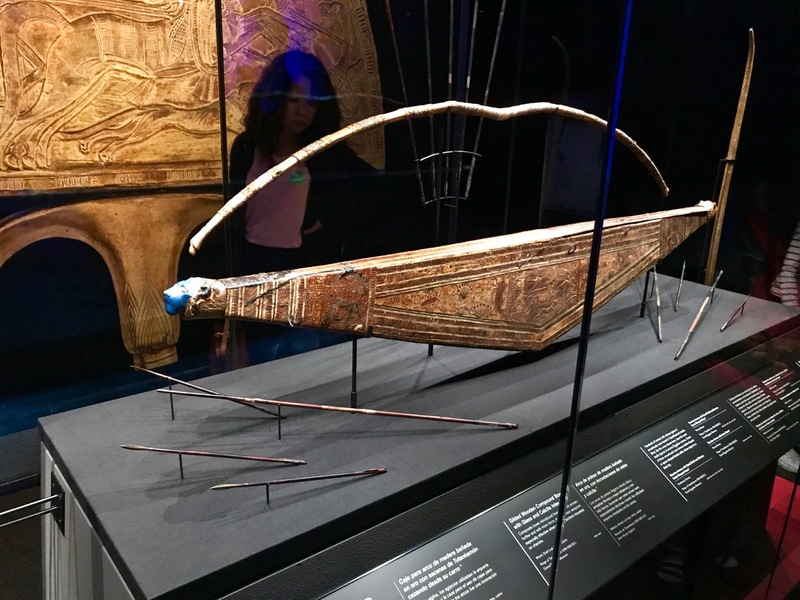 You had to be pretty strong to shoot with this bow. Bangles music played in my head throughout the exhibition, and we walked on. 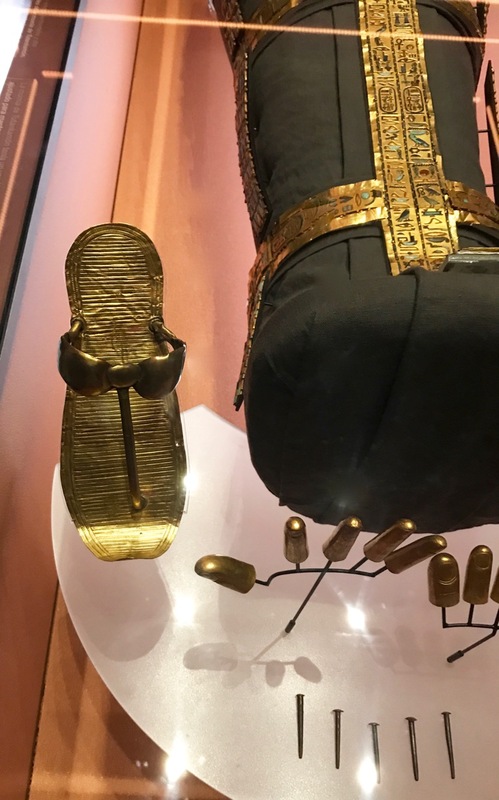 … The display included some sandals. 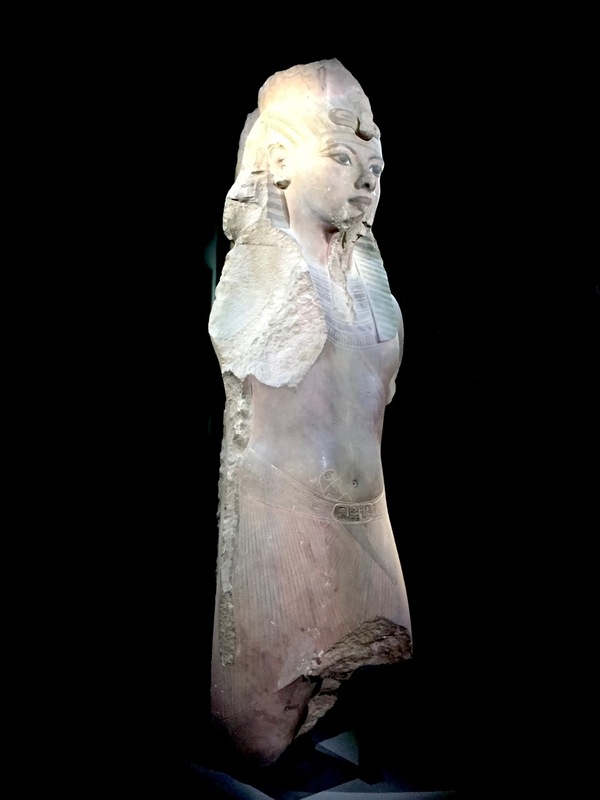 By now, we were more than an hour in, and all the galleries were getting very crowded. 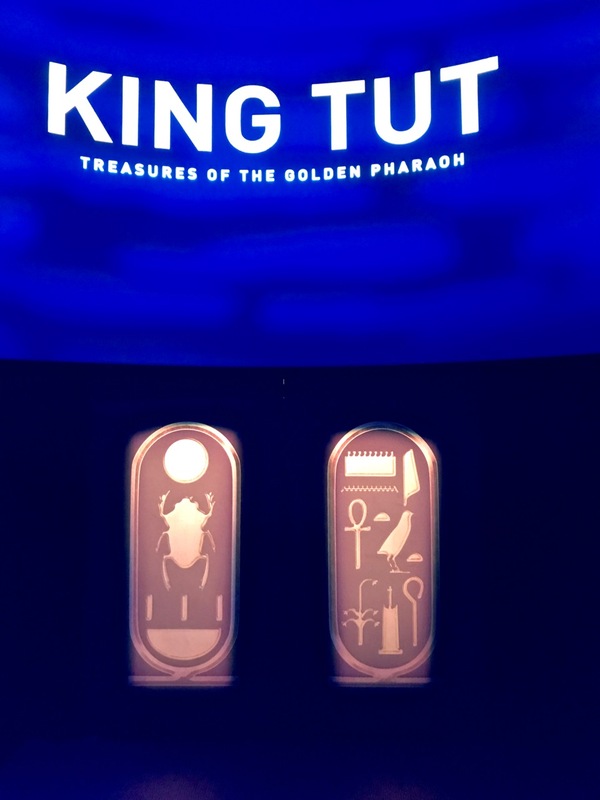 We had seen most of the 166 objects by the time we exited, but that was not the end of the Tut exhibition. 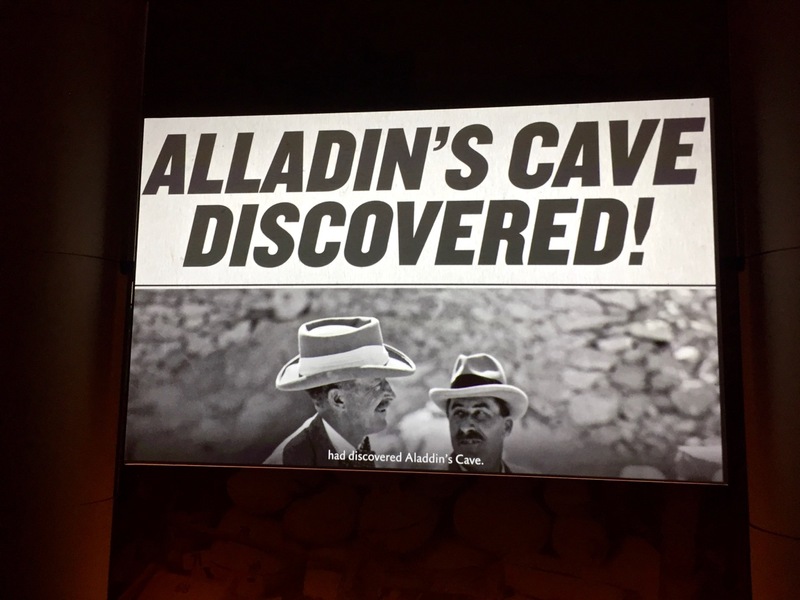 We headed downstairs for the continuation of the self-guided tour, but we took a slight detour. Admission to Tut includes a free ticket to check out the Space Shuttle Endeavour. 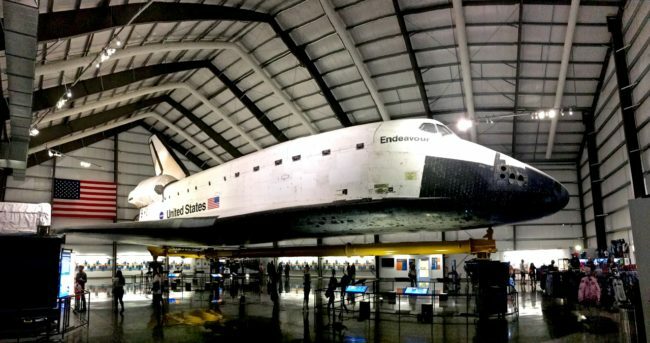 We visited the shuttle years before when it first arrived in Los Angeles. 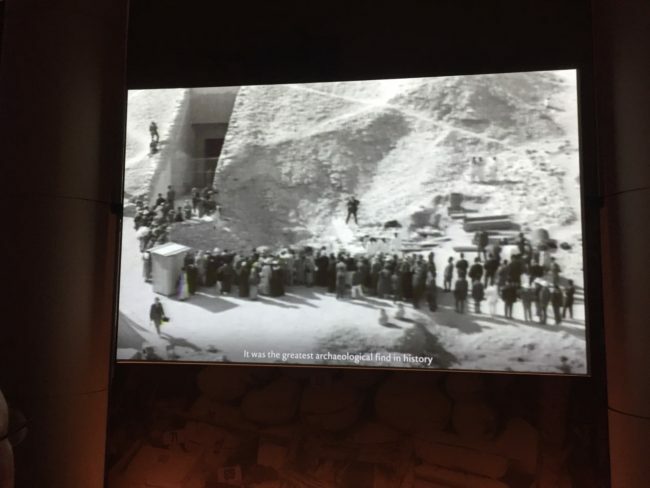 The crowds, as you can see, are much less now. 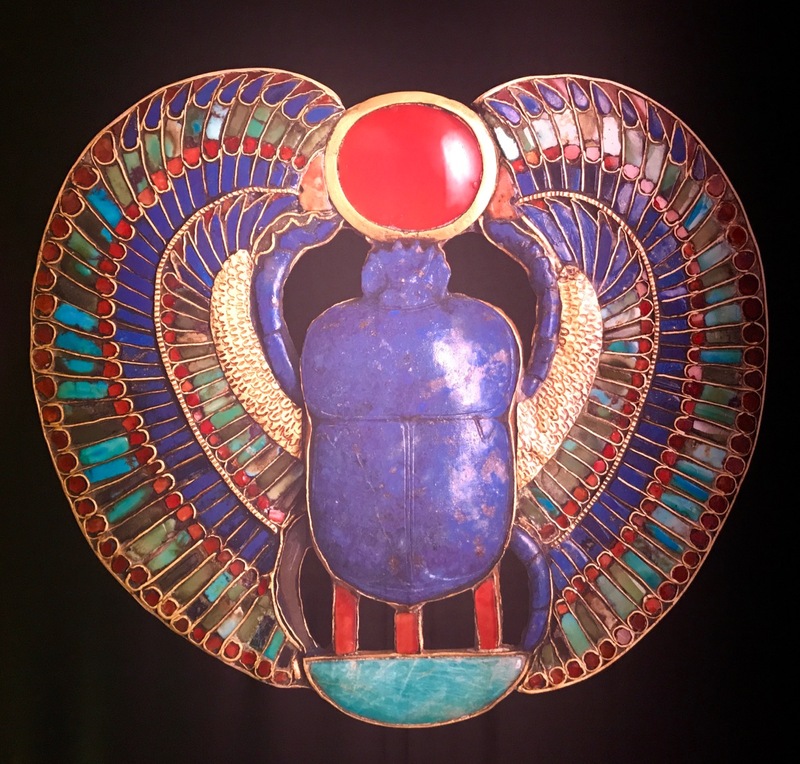 Finally, we entered the downstairs Tut gallery, where there are more jewelry and other pieces displayed. 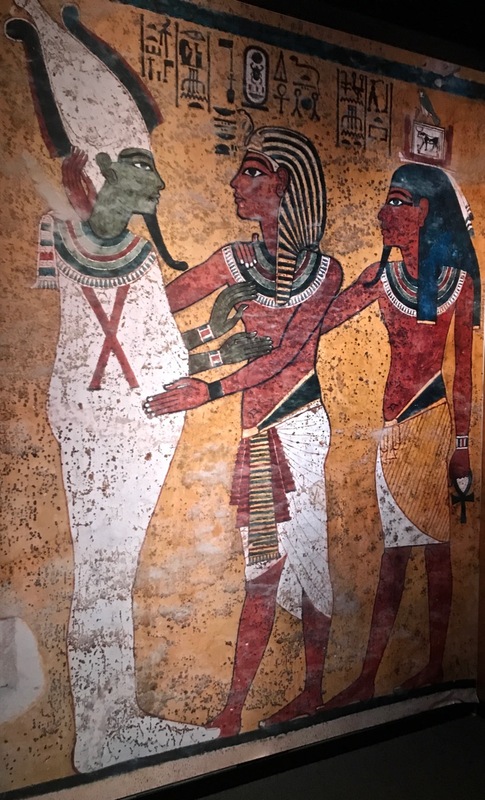 This gallery concentrates more on the history of finding the tomb and the excavation work Carter and Herbert painstakingly did during those many years. The short movies were interesting. 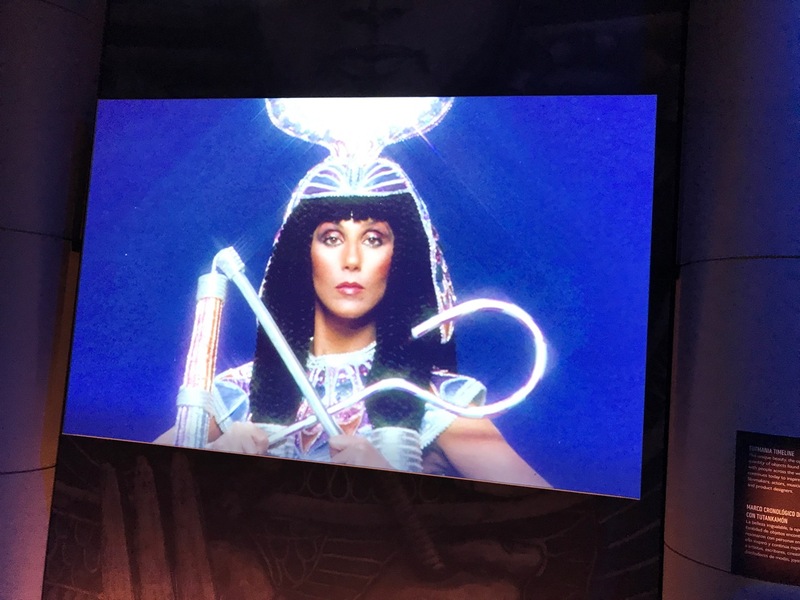 There was also a video discussing the marketing of the pharaoh and his place in pop culture, which included a snippet of Cher and, of course, “Funky Tut” himself, Steve Martin. 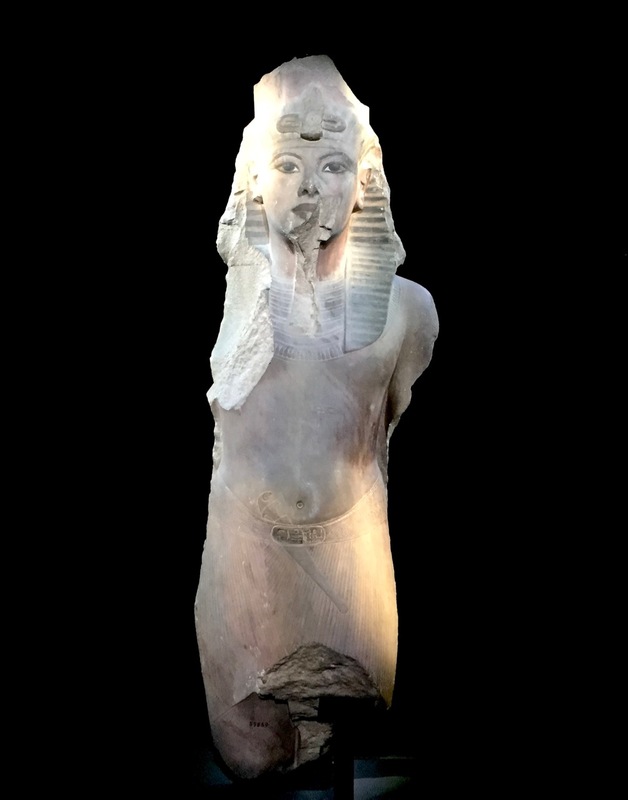 Before exiting, the Colossal Quartzite Statue of Tutankhamun loomed ahead. 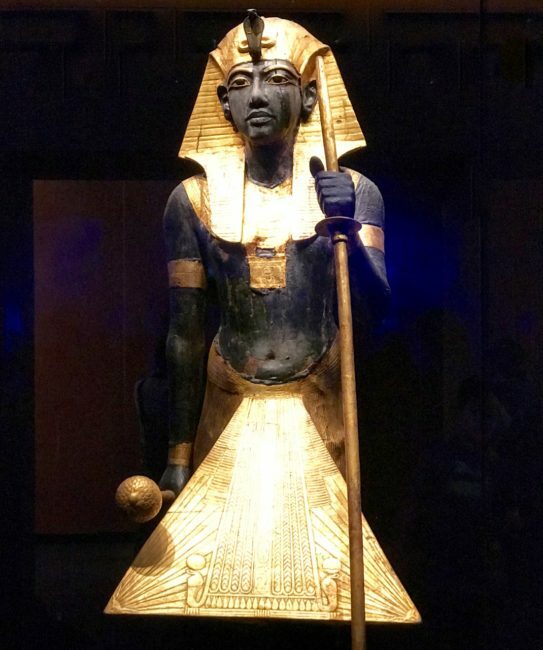 The statue was one of two that stood at Tut’s mortuary temple. 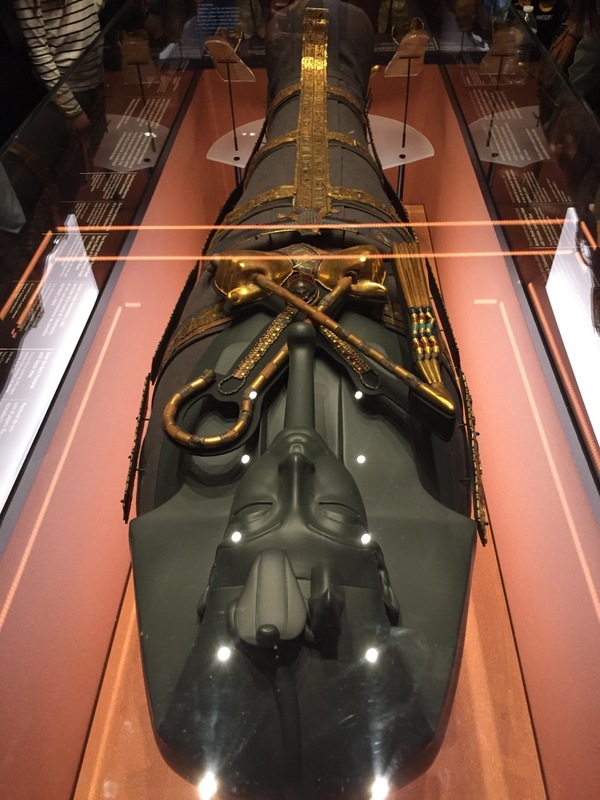 That large piece concluded our visit to the exhibition featuring the most famous pharaoh of them all. Tut’s afterlife belongings will be hanging around Los Angeles until January 2019. 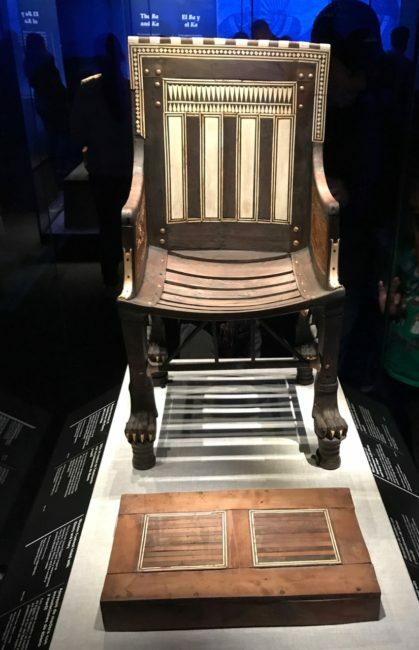 It will be his last (and only) U.S. stop. 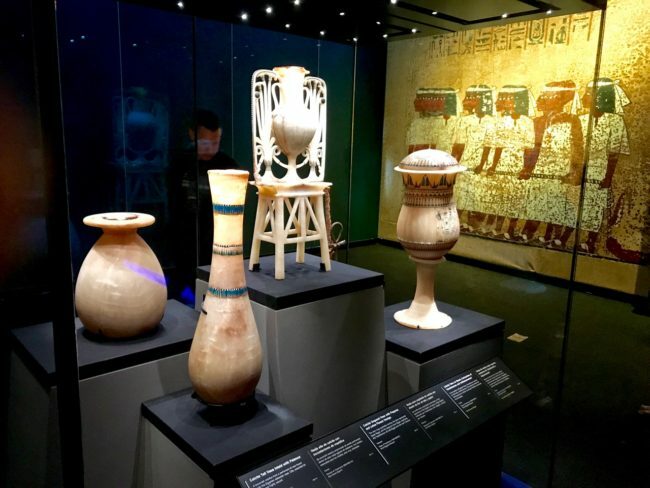 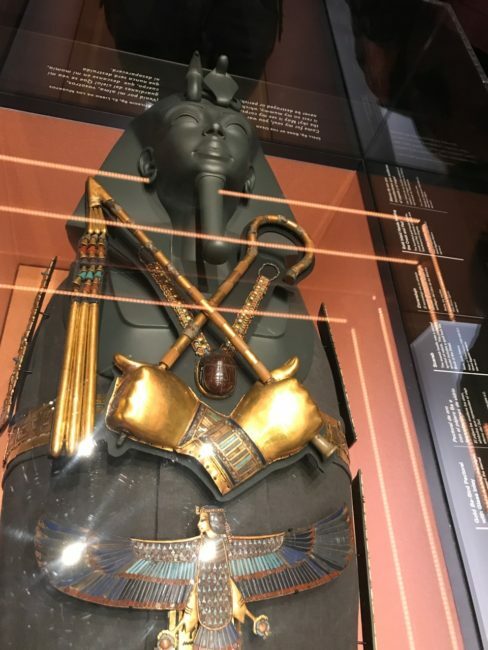 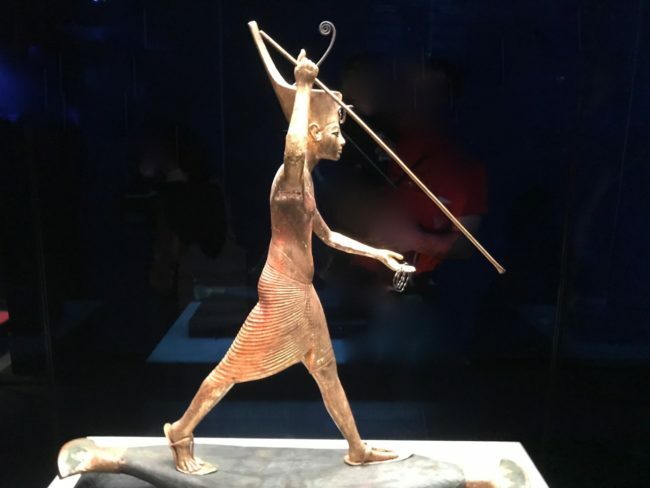 Then the exhibition heads overseas for a final European tour before taking up permanent residence at Cairo’s Grand Egyptian Museum, located near the Pyramids of Giza. 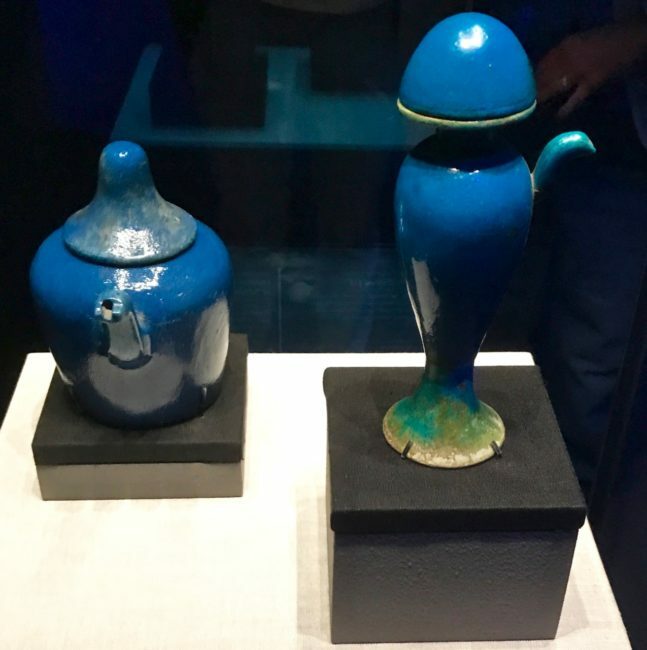 When you ponder that these items are more than 3,000 years old, it’s remarkable they have remained in such good condition. 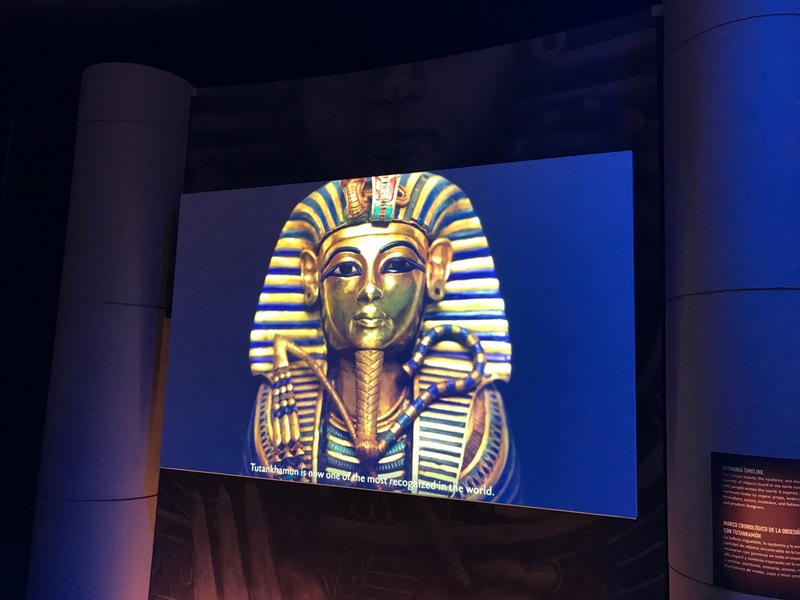 Go online and choose a date you want to see King Tut: Treasures of the Golden Pharaoh, and secure your tickets. 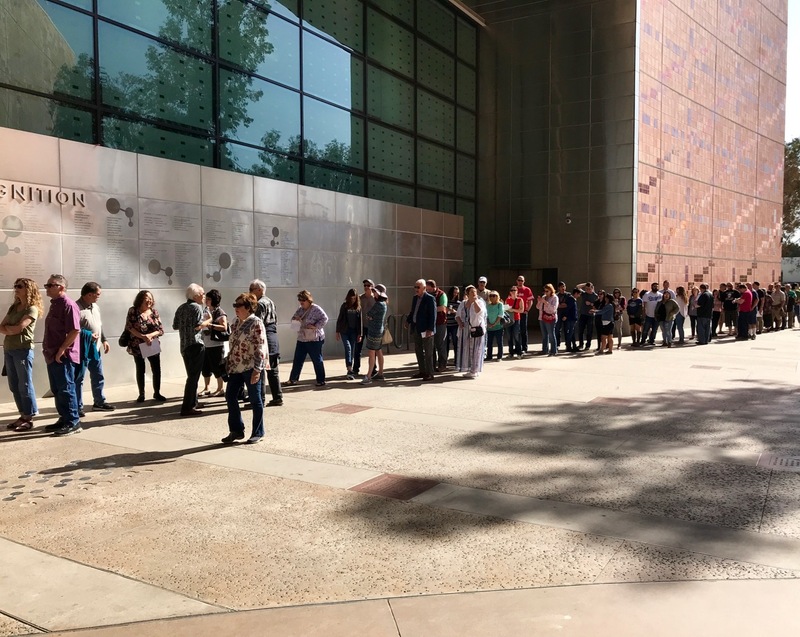 My one strong recommendation is to reserve the earliest entrance time so you can beat the large crowds. Remember … “He gave his life for tourism,” but you don’t have to!